What is Hubcap Prayer Wheel? Hubcap Prayer Wheel is a high-quality vinyl decal that depicts the most popular mantra in Buddhism, Om Mani Padme Hum. Long ago in Tibet, people began inscribing this mantra onto prayer wheels that were turned by hand, water, or wind. With every spin of the wheel, the prayer spread through the universe. 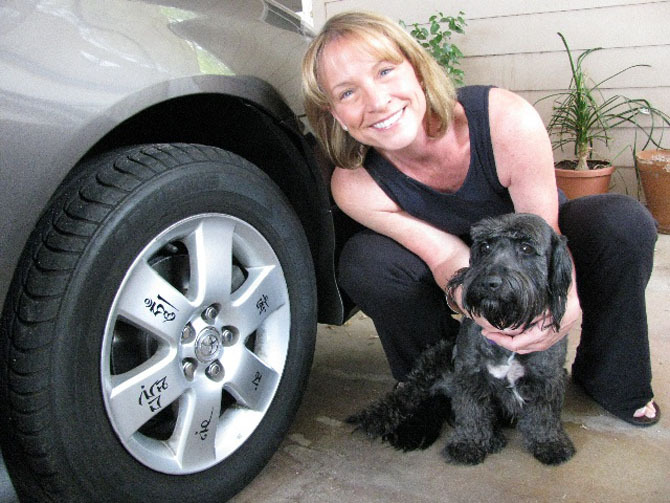 By affixing our decal to your hubcap, you can convert your car into a mobile prayer wheel. With Om Mani Padme Hum revolving as you drive, you can help ease your karma while radiating wisdom and compassion into your life and into the world. The decal shows Tibetan script of the mantra, which is derived from Sanskrit the original language of Buddhism; the individual characters are syllables, not letters. The Dalai Lama says that "the six syllables, om mani padme hum, mean that in dependence on the practice of a path which is an indivisible union of method and wisdom, you can transform your impure body, speech, and mind into the pure exalted body, speech, and mind of a Buddha." Buddhists speak of the wheel of life: the cycles of birth, life, and death, and of karma, which drives the circulation of cause and effect. You may have complex feelings about your car, a sense of appreciation that it carries you where you want to go mixed with great concern for the costs of the fuel economy on the environment. However you feel about your car karma, however, your intention can still make it a vehicle for sending this prayer out into the world. Make the process of putting the decal onto your hubcap a meditation. Chant om mani padme hum throughout the process, or move with focused awareness, or contemplate the wheel of life, the cycle of endings and beginnings. Whatever works for you.